4GB 2RX8 DDR3 1066MHz PC3-8500S 204PIN SO-DIMM Laptop RAM x 1 piece. Module specifications: 204pin. Frequency: PC3-8500S 1066MHz. Before you order, make sure the RAM is compatible with your motherboard/CPU. 4GB 2RX8 DDR3 1066MHz PC3-8500S 204PIN SO-DIMM Laptop RAM x 1 piece. Module specifications: 204pin. Frequency: PC3-8500S 1066MHz. We'll promptly reply you. Warranty: Warranty lifelong. 4GB 2RX8 DDR3 1066MHz PC3-8500S 204PIN SO-DIMM Laptop RAM x 1 piece. Frequency: PC3-8500S 1066MHz. Bronze Samsung Galaxy Tab S 10.5 T800/805 LCD Display Touch Digitizer Replace @3. Before you order, make sure the RAM is compatible with your motherboard/CPU. 4GB 2RX8 DDR3 1066MHz PC3-8500S 204PIN SO-DIMM Laptop RAM x 1 piece. Frequency: PC3-8500S 1066MHz. 4GB Total Capacity. Every A-Tech ram module is tested for complete functionality before it leaves our doors. Give your computer the best, trust A-Tech! Designed for Apple Computer Systems. All of the components in our modules are sourced from the top manufacturers and only utilize new and new condition components. Type: 240-Pin DDR3 Dimm. Capacity: 4GB. New Arrival. We will try our best to solve any problems. Ruturn Policy. Buffering/Ecc: Non-ECC Unbuffered. Type: 204-Pin DDR3 Sodimm. Capacity: 4GB. Compatible with most of the Laptop (Samsung IBM Dell HP compad Toshiba Etc?. We will try our best to solve any problems. Ruturn Policy. Buffering/Ecc: Non-ECC Unbuffered. ). Speed: PC3-8500S 1066MHz. Capacity: 4GB. DO NOT send without communication. Warranty only apply on the stated warranty period products. 8GB PC4-19200 DDR4-2400MHz 288Pin YRUIS DIMM Desktop RAM 1.2V CL15 RHN02. 8GB 2x4GB Capacity. YRUIS 2 x 8GB 16GB PC4-19200 DDR4-2400MHz 288Pin CL15 1.2V DIMM Desktop RAM RHN2. YRUIS 4GB 8GB 16GB PC4-19200 DDR4-2400MHz CL15 1.2V DIMM Desktop RAM RHN02. DDR3 1066MHz (PC3-8500). We’ll promptly reply you. 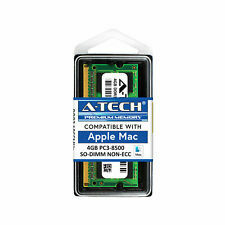 Frequency: PC3-14900U DDR3 1866MHz. Number of Pins: 240pin. Before you order, make sure the RAM is compatible with your motherboard/CPU. We will reply you as soon as possible. This policy ensures that everyone receives proper recognition and makes the process easier and smoother for both parties. Condition:NEW SYSTEM PULL : Product has been removed from NEW-OEM surplus system that has never gone into service. Speed: PC3-8500R 1066MHz. Type: DDR3 240Pin Desktop Reg-DIMM. Buffering/ECC: ECC, Unbuffered. Capacity: 4GB. Orders will be processed instantly and dispatched in 24 hours normally, so we do NOT accept any requested note before or after you place orders. 144pin SDRAM. 240pin DDR3. 4GB 240pin DDR2. 204pin DDR3. Technology -- DDR3 SDRAM. Capacity -- 4GB. ECC Server RAM. Tablet Laptop Screen Part. 8GB PC4-19200 DDR4-2400MHz 288Pin YRUIS DIMM Desktop RAM 1.2V CL15 RHN02. YRUIS 4GB 8GB 16GB PC4-19200 DDR4-2400MHz CL15 1.2V DIMM Desktop RAM RHN02. YRUIS 1 x 4GB PC4-19200 DDR4-2400MHz CL15 1.2V DIMM Desktop RAM RHN02. GenuineCorsair SO-DIMM 4GB DDR3 1066MHz CL7 for Apple. Timing: CL7. Number of pins: 204. Frequency: PC3-8500S 1066MHz. Orders will be processed instantly and dispatched in 24 hours normally, so we do NOT accept any requested note before or after you place orders. The pictures are for reference only. Model F3-8500CL7S-4GBRL Number of Pins 240 Bundle Listing Yes Capacity per Module 4 GB Number of Modules 1 Type DDR3 SDRAM MPN Does Not Apply Brand G. SKILL Bus Speed PC3-8500 (DDR3-1066) Form Factor DIMM Total Capacity 4 GB UPC Does not apply. Frequency: PC3-8500U 1066MHz. Number of Pins: 240pin. Before you order, make sure the RAM is compatible with your motherboard/CPU. Type: 240-Pin DDR3 Dimm. We will try our best to solve any problems. Ruturn Policy. Type: DDR3. Application:laptop /notebook. 100% Original,not copy;Full capacity,not upgrade. Frequency: 1066MHz/PC3-8500s. Function: Non-ECC. COMPONENT RANK -- 2RX8. COMPONENT DENSITY -- 4GB. Pleasure deal with your purchasing from us. Picture For Reference Purpose Only. LCD Inverter. Hope you can understand. Other Countries Depend on the item price. 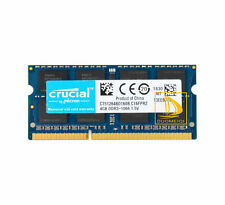 Brand Crucial Form Factor SO-DIMM MPN Does Not Apply Type DDR3 SDRAM Number of Pins 204 Bus Speed PC3-8500 (DDR3-1066) Total Capacity 4 GB Number of Modules 1 Capacity per Module 4 GB UPC Does not apply. DDR3 1066MHz (PC3-8500). 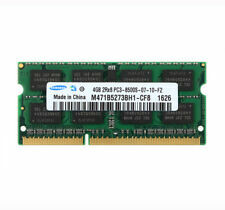 1 Stick For Samsung 4GB PC2-6400 DDR2 800Mhz 240pin High Density Desktop AMD RAM. For Samsung Galaxy J5 2015 J500F J500 Hot Housing Battery Door Back Cover Case. AMD Athlon X4 760K 760 K 3.8G Quad-Core CPU Processor AD760KWOA44HL Socket FM2. OWC SO-DIMM DDR3 2x4GB 1066MHz CL7 Apple QualifiedOWC8566DDR3S8GP / SBOWC3G08APPLE2. CAS Latency: CL7. Rodzaj pamięci: SODIMM DDR3. Radiator: Nie. Całkowita pojemność pamięci: 8192 MB. Samsung 48GB (12x4GB) 2Rx4 PC3-10600 Low Profile DDR3 ECC Server ram. Condition is Used. Shipped with USPS Priority Mail Small Flat Rate Box. COMPONENT DENSITY -- 4GB. New Arrival. Other Countries Depend on the item price. Unknown item sent to us will be discarded. PIN COUNT -- 204-PIN. CAS LATENCY -- CL7. COMPONENT RANK -- 2RX8. ERROR CORRECTION CODE ( ECC ) -- NON ECC. Apple Xserve Early 2009 Quad-Core and 8-Core. 4GB DDR3 PC3-8500E 1066MHz Unbuffered ECC 240 pin DIMM. Apple Mac Pro Mid 2010 Quad-Core and 8-Core ONLY. Apple Mac Pro Early 2009 Quad-Core and 8-Core. DDR3 1066MHz (PC3-8500). 1X 8GB Kingston HyperX PC3-12800 DDR3-1600MHz 240Pin CL11 DIMM Desktop DIMM Ram◎. 16pcs Shoelaces Elastic Silicone Flat Shoe Lace Set for Kids & Adult for Kids ◎. Plastic Locking Shoelaces Shoe Laces Best for Trainer Running Jogging Sporting ◎.